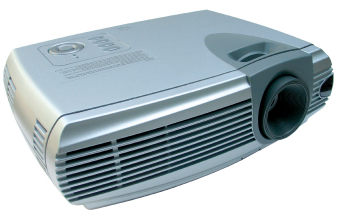 Buying the right LCD or DLP projector for your presentations doesn’t have to be complicated. Choose the right supplier and they’ll make it easy in terms of helping you decide what specs you need: brightness, resolution, and other features. They’ll also make sure you have all the right cables and accessories. And they can even outfit you with everything you need to hit the road, including a protective carrying case. If you’re going to be traveling with your projector, make sure you compare the weights of the models you’re evaluating. Don’t feel like you have to get the absolute lightest model, but you should avoid the 10-pounders. Today’s projectors, whether you’re looking at a DLP or an LCD model, tend to be quite lightweight and even models not classified as “portable” might be used as such without too much difficulty. As far as the specific display technology, both LCD and DLP models can offer excellent projection capabilities. LCD, which stands for “Liquid Crystal Display,” works by passing light from a halogen lamp through red, green and blue panels. On those panels, pixels can be open or shut to allow light to pass through or to block it, creating the appropriate image color as the light from the panels merges on the projector screen. DLP, or “Digital Light Processing,” projectors rely on thousands of microscopic mirrors which are arranged on semi-conductor chips. Each mirror represents one pixel in the resulting image and control the visual image by being rapidly repositioned to either reflect light out through the lens or trapping it internally. DLP machines can either use one chip or three chips, with three chip machines producing sharper and higher-quality images. Pricing for a projector that is suitable for an office environment will start at a bottom of around $800, but a good machine (enhanced image clarity, greater distance that you can mount the machine from the screen, etc) will cost more. How much control will you have over the lighting levels in the room where the projector will be used? How many people will typically be viewing images with your new projector? Do you have a preference for LCD or DLP technology? Are you interested in a portable or lightweight model (typically more expensive)?